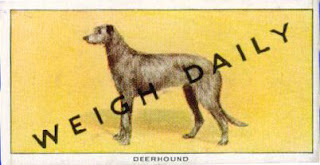 As a seasonal gift before the holidays - Rogue has compiled a little dictionary over at Wordie.org for all owners to start communicating with their deerhounds in a familiar tongue - yes, Rogue can tell ye, short of the gaelic, these are words that all deerhounds will naturally understaun’ as it’s in our genetical make-up. But watch oot! as some of the dictionaries don’t list them or their definitions. Keep drappin’ back as the wordie list for ‘bonnie lads and lassies’ will grow over time. Had to share this little ditty with everyone - although, I like how the history of my clan starts from the ‘15th Century in the British Isles’ according to the ‘FOX News‘ reporter. As a deerhound that can dig, I’ll contest that history - read back through my blog for family history from the hounds teeth - the time dated Pictish stone carvings of the 7th century has to knock that historic start point on the head. Enough grumbly wittering tho, it’s guid tae see my ‘Albannach Chairdean’ across the pond on the telly vision. The worst deerhound painting ever? As a hound, I like to celebrate my hound culture, but sometimes as a highlander, I have to laugh at the representation of the highland way. This painting brings a smile to the teeth of any self respecting deerhound. What have we got here? First . . . lets start with the three shrunken teddyhounds? Or maybee not. How about the beardy bloke who has been duped into dressing up in his ‘grans’ tartan dress whilst holding his shotgun with ‘Action Man’ real grip hands and wearing a childs London policeman helmet painted as a deerstalker. Hey! all kilties know that the kilt should never reach below the centre of the knee! And where is he looking? I fear he has spotted a ‘white lady’ on the ridge and can’t see the deer frozen on the opposite Loch Bank, for fear. Then we have the deer themselves - are they deer? They look like the Blackpool fairground racing camels - ‘keep rolling yer balls’ and they might evade the kneeling marksman pointing his stick in their direction. And that Tam o’ Shanter bonnet he is wearing, not quite the blue lowland bonnet but it matches yet another ‘granny dress’ . . . hmm? If them deer scarper quick enough, they might just make it up to that rock quarry we see just along the glen apiece . . .
. . . enough ya cynic! It would be possible to spend a day in this painting having fun, and it is clearly someones passion, however misplaced we deerhounds might feel it to be. Criticism and comments welcomed here. 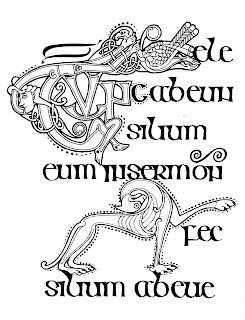 From the Gospel of St. Matthew in the Book of Kells comes this hand stylised, text embelishment, possibly representing the hunting hound of 8th century Celtic life. Something the Christian pilgrim/missionaries would have been familiar with at that time. The book of Kells is currently housed in the Library of Trinity College, Dublin. But for your own special page, dig out your colouring pencils - grey, black and white probably being the only colours you’ll need. Click and Print out this image, then you can have your very own ancient illustrated deerhound from around late 700AD to colour-up in the 21st Century. The marvels of modern day deerhounds using technology. The Deerhound fun will continue. Well, the winter edition of the UK deerhound club newsletter has finally arrived, and yours truly appears in a photo on page 34. If you have a copy, yes, that’s me looking over my shoulder as I hurtle toward the finish line at the lure coursing this summer. If only my paw was fully healed and I hadn’t developed this kneck pain like some kind of old arthritis - I feel I could have been out there racing again. But with the dreich Scottish weather I think I’ll content myself with resting up as much as I can. It gives me the chance to read the newsletter from cover to cover. If anyone reading this is not a deerhound club member whether in the UK or from any location worldwide - I would heartily recommend they contact the club and join up. The membership fee won’t break the bank balance, it may even make ‘anither gie braw gift’ for a friend. And you will receive a quarterly copy of the newsletter above. And tell them Rogue sent ya! This has to be the maddest of ideas. But it could be a lot of fun for dog loving humans. 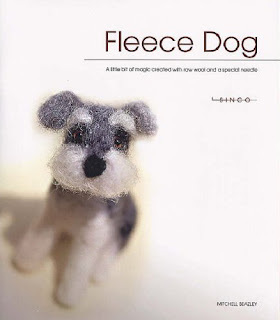 A book filled with paterns for making your very own fleece dog, and you can even use the hair from your family deerhound or hounds to make them. Simply collect the brush hair and follow the instructions. The book is available from several outlets and at good bookstores and the usual online shops. There is also a website for fleecedog simply click the link to view it. 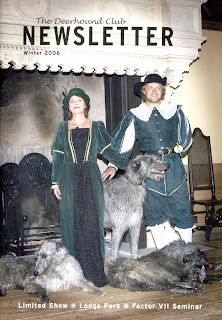 The book includes a multitude of pattern styles, the afghan pattern being adaptable to suit deerhounds, borzois, wolfhounds etc. And there is no limit to the size you make your fleecedog. Another ideal stocking filler this festive season. And whilst you are busy making your fleecedog - I’ll just polish of the turkey leftovers. 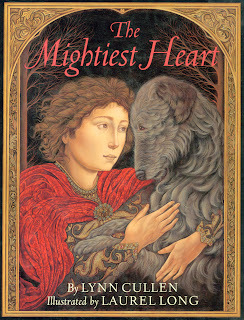 With Christmas coming-up, and the season of good will and all that - the human religions being something, as a dog, I don’t quite understand - although I do understand the spreading of joy, humanity and happiness - so if you are looking for a gift to offer this festive period, a copy of the Mightiest Heart would not go a miss for lovers of grey, shaggy coated ancient hounds. 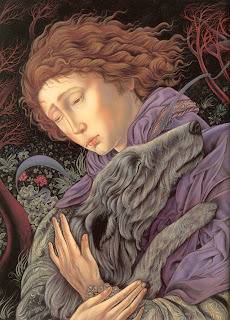 Based on the tale of Gelert (posted before), the hound of Prince Llywelyn, this US produced ‘Dial book for young readers’ is Authored by Lynn Cullen and lavishly illustrated by Laurel Long (see images below (to sleek for a wolfhound, to heavy for a deerhound)) is a must for any chrimbo stocking. No longer available in print, all ye ebayers should get busy immediately. 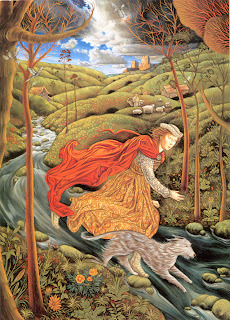 Just like deerhounds on the hunt, ‘seek and ye shall find’. I haven’t posted for a while as my human companion has been at the christmas party at the Haunted Auchen Castle near the Scottish Borders. Four poster beds, hill country rambles, a snug bar, dashing white seargents, birlin reels, pass the parcel, musical chairs, ghosts on the stairs - wish I had gone along. But way cool, as the secret santa prize (where associates pull a name from the hat and have to buy a gift for the named person) my kennel keeper received a Brodie Hunting Tartan Scarf. Hey! one of our family clan tartans. Here’s me modeling the clan crest badge on a Glen Garry bunnet sporting the nifty wee scarf. 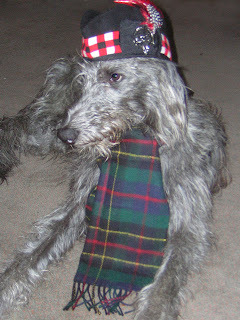 As for deerhounds, we all know about our clan tartans but for the keepers who wonder about them, the etiquette, the allegiance etc. read below, culled from the scottish Tartans Museum in North Carolina where believe it or not, their is a larger population of Scottish descent than in Scotland itself. Visit their website by clicking Tartans. What is the difference between ancient and modern tartans? Dress and Hunting? These names are responsible for much confusion when it comes to tartans. I have written an essay on the differences which has appeared in many clan newsletters and has been passes out in leaflet form at many Highland Games. Following is a brief excerpt from it, to answer these types of questions. The terms "ancient" and "modern" do not refer to different tartans, but to different color schemes of tartans. In simple terms, modern is dark and ancient is light. The distinction came about in the Victorian period when people rebelled against the very dark colors of the day with lighter shades. It was suggested that the lighter shades were more common with the traditional vegetable dyes used before the mid-nineteenth century development of aniline dyes. These lighter shades were called ancient colors, while the darker shades were known as modern. But the tartan was the same--only the value of the colors changed. Recently, it has become fashionable for mills to weave certain tartans in very muted shades of browns and grays, called either "weathered," "reproduction," or "muted" colors. These shades are supposed to represent a piece of tartan that has been buried in a peat bog for a couple of centuries, or has been overly exposed to the elements. But realize that these names do not refer to different tartans and do not refer to any kind of dating. Therefore, families like Armstrong, with only one tartan, can have that tartan woven in the ancient, modern, or weathered colors. You can have a tartan from 1815 dyed in modern colors, and a tartan designed in 1985 woven in ancient colors. Often you will have a tartan that is actually older in date than another of the same name. This is distinguished by the prefix "old." The terms "ancient" and "modern" generally come after the tartan name. Thus Old MacLachlan, modern, describes the older of two MacLachlan tartans dyed in the darker modern colors. 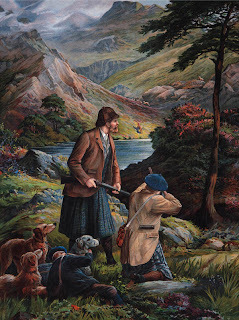 Hunting and Dress tartans also cause much confusion among the uninitiated. These names also refer to color changes, not to any kind of actual usage. Dress tartans are based on the old arasaide tartans worn by women in the Highlands of the 17th and 18th centuries. These tartans had a white base. Today's dress tartans are made by replacing one of the prominent field colors of a tartan with white. These are used most frequently in dancing, but are often seen in formal and even casual occasions. There is no rule that says one has to wear a dress tartan to a formal occasion. Most men do not. Hunting tartans came about in the mid 1800s when two versions of the MacLeod tartan were published in a book called Vestiarium Scoticum (later proved to be a fake--but there is not enough room to go into the history of this important book here). There was a bright yellow MacLeod (MacLeod of Lewis), called "dress" and a green and blue tartan (MacLeod of Harris) called "hunting." The green tartans became very popular after this and most families who had bright red or yellow based tartans designed alternate tartans with a green background (or sometimes brown) and called them "hunting." Families whose tartans are mostly green do not usually have alternate hunting tartans. These tartans actually had little to do with hunts. Whether you wear a modern or ancient tartan, hunting or dress, or any other form of your tartan is up to you. Do I have to wear a tartan that associates with my last name? No, although this is a common misconception. Too many people think there are too many rules about tartans and kilts. One has to understand that many of these "rules" are simply tradition, and often misplaced tradition. Your ancestors would have worn a tartan based on their aesthetic tastes and not family lineage. To paraphrase "Scotty" Thompson, author of So You're Going to Wear the Kilt?, there is no such thing as the right to a tartan. He describes three types of rights listed in the dictionary--moral, legal, and divine (as in the "divine right of kings). Since it is neither immoral, illegal, or ungodly to wear a tartan, it makes no sense to speak of the "right" to a tartan. There are actually very few tartans with restrictions placed on them (such as the Royal Family's Balmoral tartan). So wear any tartan you like. Just remember that in today's society, tartans mean something. They represent something. And by wearing a tartan you are honoring whatever that tartan represents, be it a clan, family, or location. Many people choose to wear a tartan that associates with their family, but some choose to wear the tartan of a good friend, a mentor, or to commemorate a historical event (such as the Culloden tartan, or the Jacobite tartan). Whatever the case, be aware of what the tartan you wear stands for and wear it proudly.